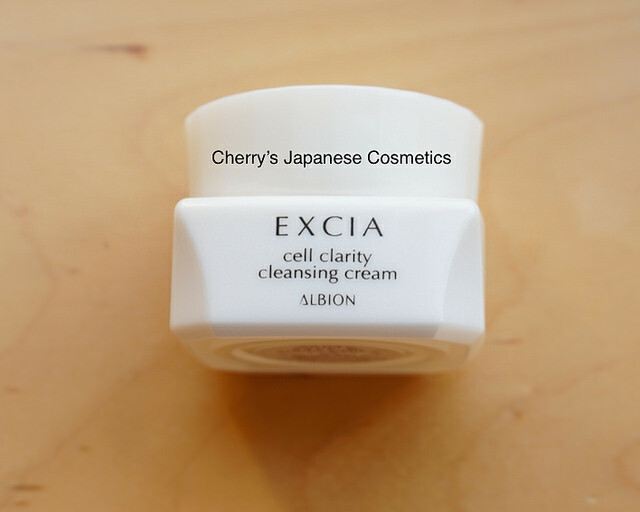 I (Cherry) got a small jar of Albion Excia AL CELL CLARITY CLEANSING CREAM, a makeup remover new for AW2016. Please let me share with you my personal review. I like oils as my makeup remover, but the second best for me is cleansing creams. Because they are quicker to remove my waterproof makeup. Coffret D’or Super Sharp WP are waterproof eyeliner, it is not always easy to rid off. When I use gel/ liquid makeup removers, all of they I had tried can not remove those waterproof makeups, and some of they are even hard to remove Lunasol Liquid Lips. I applied this cream and touched carefully. Compared with those things, you can significantly see how easy to remove waterproof makeups by this Albion cleansing cream. This is the reason why I recommend to use oils or creams to remove your makeup. There is another note. It has perfume. In person, I care items with perfumes, but I do not care for those items what is designed to rinse off. And I know some people who does not wash their faces after using these makeup removers, but I recommend to wash after this makeup remover. I feel it is really greasy without washing. Please check the latest price, and order from here: Albion Excia AL CELL CLARITY CLEANSING CREAM, or order in our JPY Branch!